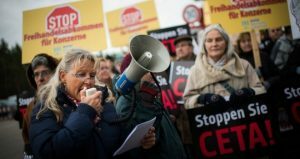 “For the U.K. this is of extra importance, as under CETA’s anti-democratic terms, we could still be open to being sued in corporate courts up to 20 years after leaving the E.U.,” said War on Want senior trade campaigner Mark Dearn. Moreover, CETA was negotiated prior to Britain’s decision to leave the E.U. ; in the wake of Brexit, tariff rate quotas for Canadian meat would be “exceedingly high” and impact European farmers “already facing a crisis over low agricultural prices,” the report found. That’s especially concerning because, according to the council, Canada is “the third-largest producer of genetically modified organisms (GMO) in the world.” The country also recently approved GMO salmon, which under CETA could be sold and eaten internationally.